The 64mm Oil Filter Wrench is compatible with 1.8Liter, 4-cylinder Toyota, Lexus and Scion vehicles. Unlike most Toyota oil filter wrenches, the filter wrench is crafted from high strength aluminum to ensure it gets the job done. This 1.8Liter oil filter wrench features a 14 flute design in order to prevent play and slipping on the oil filter cartridge cap. The special design of this Toyota oil filter tool engages both the teeth on the oil filter housing, and also the 64mm ring on the top of the oil filter housing. This provides the maximum amount of contact, which, in turn, prevents slipping and damage to the oil filter housing. 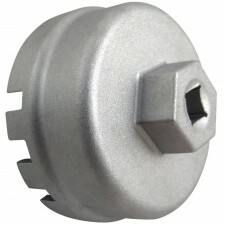 This oil filter cap wrench can be used with both a 3/8 inch drive ratchet and a 27mm socket. The 3/8 inch drive is for tightening the oil filter, and the 27mm hex head is for loosening the oil filter.